Dr Homi Sethna, former chairman of the Department of Atomic Energy, may be in his eighties, but his vitality and liveliness make an immediate impression. Equally surprising is the busy schedule he continues to maintain. "We belong to Dr (Homi) Bhabha's school of thought, you see. We are disciplined to take up any challenge. Dr Bhabha taught us to be ageless. So here I am, working more than 12 hours a day, pooh-poohing failing health," he explains, reading your mind. When Dr Homi J Bhabha set up India's Department of Atomic Energy as well as the Atomic Energy Commission in the late 1940s and early 1950s, he personally selected a team to work with him. Dr Sethna, a chemical engineer, was hired along with Dr P K Iyengar, Dr Vasudev Iya and Dr Raja Ramanna. Dr Sethna and his team led by Dr Ramanna worked on Project Smiling Buddha, that led to India exploding its first nuclear device on May 18, 1974 at Pokhran in the deserts of Rajasthan. He was awarded a Padma Vibhushan in 1975. After his retirement from the Government of India, Dr Sethna has been closely associated with several Tata companies. Says Dr Sethna, "Talking about scientific experiments of our time won't be an easy task. I am an old man with a failing memory. In fact, I can't even recall my career chart these days. I won't be able to give you any periodic account of events. For, time has erased the dates from my mind. Whatever I say will be an old man's way of recounting the past." To mark Dr Bhabha's 40th death anniversary, Dr Sethna spoke to Senior Assistant Editor (Features) Indrani Roy Mitra about the father of India's nuclear programme, punctuating his tribute with thoughts on the progress of science in modern India. What was Dr Bhabha's vision? We won't do justice to Bhabha's memory if we assess him as a scientist alone. Rather, he was a visionary, who dreamt of India gaining self-reliance through progress in the field of nuclear power. He was a dreamer, who visualised a lively picture of a powerful India, rich in scientific knowledge, and fearless in making experiments. Science, especially nuclear science, was not exactly Bhabha's passion. It was his way of life. What do you feel was his most important contribution to science? Bhabha was the architect of nuclear science in India. I am too small a person to talk about his contribution to science. As students, we admired his Cascade Theory of Electron Showers, which he presented with (German-Irish scientist) (Walter) Heitler in 1937. It is called the Bhabha-Heitler Cascade Theory, hailed as an indispensable part of physics. The theory explains the process of electron showers in cosmic rays. Cosmic rays are fast-moving sub-microscopic particles. They comprise protons, electrons and gamma rays. When some of them approach the earth and enter its atmosphere, they collide with atoms in the air, which in turn give birth to new nuclear particles. Bhabha's theory explains the processes and effects of this reaction. It is considered a pioneering work to (bring) understanding to one of the most baffling mysteries about cosmic rays. Apart from this, Bhabha left his mark in the elementary particles and quantum theories as well. Bhabha was the first to realise that the consumption of energy in the world is on the increase. Naturally available resources of energy, like coal and oil, are on the wane. To counter this, he declared that atomic energy is the only foundation for the progress of industries in India. He suggested a method of producing electricity by nuclear methods. Bhabha established two great research institutions -- the Tata Institute of Fundamental Research and the Atomic Energy Establishment at Trombay, which after Bhabha's death was renamed the Bhabha Atomic Research Centre. What was his style of functioning like? Working with Bhabha was quite an experience. To him red-tapism stood for immobility and bureaucracy for inertia. While doing elaborate experiments, he ensured that none of the mandarins meddled with his progress. With astuteness and brilliance, Bhabha had evolved a unique system of work wherein scientists working with him and under him could act freely and fearlessly. A system of government figured low in his dictionary and scientific excellence always topped his agenda. If he had to work with bureaucrats, he made them follow his mind. Such was his organisational skill. Dr Bhabha was known for his patriotism and his belief in India. How did it reflect in his work? The early atomic age of India -- the 1960s -- was a period of transition. At that time Bhabha gave a clarion call to young scientists who were staying abroad: Return to the Motherland. Many young scientists listened to his call and came to work under him. Today many of them are among (our) reputed scientists. Bhabha took personal care to provide the necessary amenities to them. He inspired his team members and gave them the freedom they needed to pursue their work. He gave them every opportunity to grow. He thus succeeded in building up a team of excellent workers. What does India owe Dr Bhabha? On May 18, 1974, India conducted its first nuclear explosion for peaceful purposes, at Pokhran in Rajasthan to emerge the world's sixth nuclear power. The other five countries with nuclear know-how then were the USA, Russia, Britain, France and China. India owes this achievement to Bhabha. It was he who put India on the world map of nuclear science. The seeds of India emerging into an important nuclear power were sown by Bhabha. Did he put India on the right track? Bhabha ushered India into a world of scientific independence. He uncovered India's nuclear energy potential and showed it to the world. Thanks to his experiments and tireless efforts, India is fast emerging as one of the most important nuclear powers of the contemporary world. There is hardly any nuclear problem at present which we cannot solve. We are very much at par with France and China. We are on the right path of scientific progress and if everything goes well, we will surely supersede our competitors. On the 40th death anniversary of Dr Bhabha, let us get together to pay respect to Dr Homi Bhabha, one of the greatest scientists the world has ever produced. 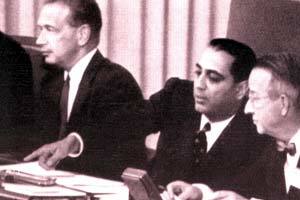 Photograph courtesy: Homi J Bhabha: Architect of Nuclear India by Dilip M Salvi, Rupa & Co.